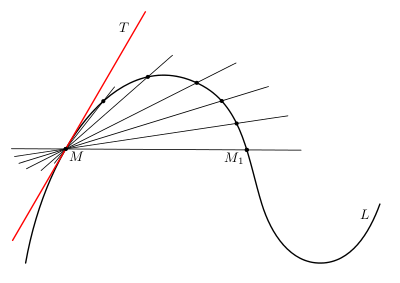 A tangent line is a line that touches another at only one point without intersecting (eg. the red line in the picture to the right). In this work, I envisioned the musical lines interacting in this way, quickly flowing up and down and bouncing off of each other. This is clearest at the onset of the piece, with high percussion and winds swooping down and passing their line to the saxophones. After some more back and forth interplay between these musical lines, a flowing melody is revealed. As this melody is revisited and developed through the course of the work, the rush of 16th notes seldom wavers, and each iteration becomes larger and more grandiose, until its triumphant ending. Listen to the Kennesaw State University Wind Ensemble, directed by Dr. David Kehler below, or download the mp3. You may download a pdf of the wind ensemble perusal score in case the embedded score below is difficult to see or does not display. Tangents is available directly from Roger Zare Music. You may purchase sets of parts or individual scores with the buttons below. Note that each set of parts comes with a score. If you need a quote for a purchase order, please contact me.